Even goddesses need a little backup once in awhile! Calling all “Chosen Ones!” You’ve been granted first access to Cyberdimension Neptunia: 4 Goddesses Online. The game is available tomorrow on PS4! With nine classes to choose from, it can be challenging to pick one. Check out tour new player’s guide to help you choose your class and dive straight into the world of Alsgard! What is 4 Goddesses Online? 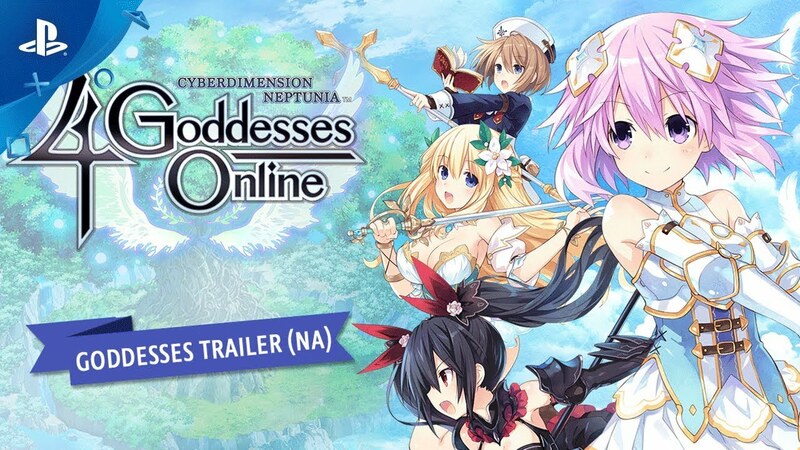 4 Goddesses Online is an MMORPG game within the game Cyberdimension Neptunia: 4 Goddesses Online! So what does that mean exactly? You’re playing as characters playing an MMORPG. 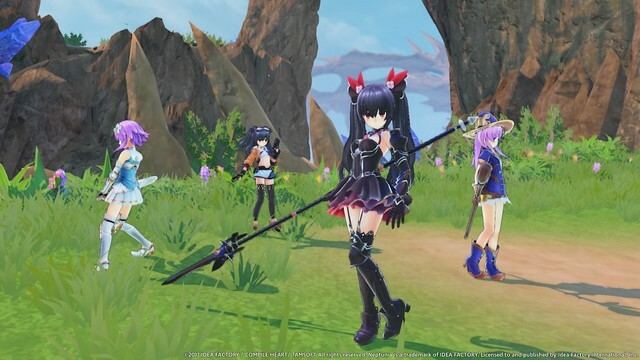 Cyberdimension Neptunia: 4 Goddesses Online isn’t an MMORPG, but it’s a hack ‘n’ slash action RPG with gameplay elements like job classes and a chat system. There’s even a multiplayer mode that allows you to team up with other players in your region if you have a PlayStation Plus subscription. The world of Alsgard was created by The Four Goddesses. They have defended Alsgard from the Demon King Jester, and since that infamous battle, one thousand years of peace have passed. Choose a character, each with her own unique job class, and fight to save Alsgard! Melee attacks and magic are the Paladin’s middle name! Because of their healing abilities, this is a well-balanced class for starting players or for those who fight to defend others. This is a class descended from the ancient knights who fought alongside the Goddesses themselves. If you wish to pursue the Paladin class, prepare to use your own life as a shield! Clad in jet-black armor, these fearsome Black Knights charge headfirst into battle to strike the enemy first! Great for close-combat, they can deal damage quickly and with ease. Black Knights are a class of warriors who lost their loved ones in the war against the Demon King Jester. To become a Black Knight, you must channel the hatred held in your heart into your blade! Priests are vital to any adventuring party. They provide unending support from the rear and must balance dodging enemy attacks and healing their party. If you are drawn to the call of priesthood, steel yourself against all evils and you will become the light that saves your allies! Enchanters bend the power of nature to their will to buff up their party or heal their allies. As divinators of both magic and healing, they’re an incredible asset to any party. They’re the only class able to imbue the party’s weapons with elemental abilities. Those enchanted by the Enchanter class can look forward to juggling quick, close-combat swordplay and long-range support! Mages wield powerful magic to exploit enemies’ elemental weaknesses and gain the upper hand. Long-range offensive skills are a mage’s expertise — use it to annihilate enemies! Simple magic existed in Alsgard until the monster witch Merlin developed magic to its highest potential. Now, spellcasters wield this dangerous magic to their advantage! Quick to the draw with their pistols, thieves scurry about on the battlefield and catch enemies off guard. High speed and long-range attacks make them great damage-dealers. Hailing from the Thieves Guild, thieves are only interested in firearms, treasure hunting, and finishing their enemies off quickly! The swing of a samurai’s katana is beautiful to witness and impossible to predict. A samurai’s offense and defense is controlled with calculated and swift swordplay, making them a perfect tank. Samurai are descended from knights who learned to wield the katana. Master the ancient art of the katana and you can carve out your own fate! Lurking in the shadows, Ninjas are swift assassins who can deal multiple attacks with a quick sleight of hand. With their arsenal of attacks, they are best suited for mid-range combat. Ninjutsu was passed down from the Beast clan whose descendants were scattered after the war. Should you wish to enlist in the Ninja Guild, you must control your spirit to unlock your body’s special abilities! Acting as party leader, you can have up to three other AI-controlled members in your party. 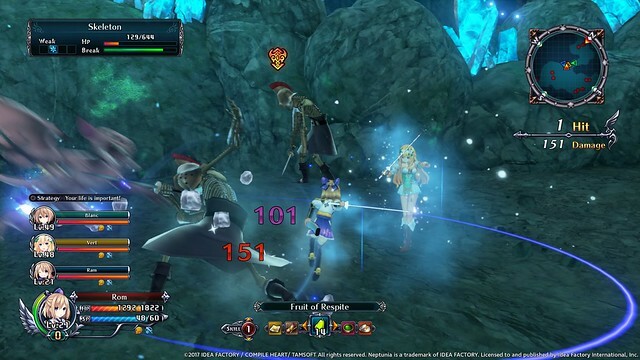 However, you can switch the lead character whenever you want in a dungeon to try out different classes and skills! As the party leader, you’ll be able to instruct your party members’ AI with different Tactics. Tactics like “We’ll Nep them up!” are particularly useful when you’re adventuring through a lower-leveled dungeon, for example. Characters learn Skills as they level up, and these Skills differ according to her class. Set skills to an action button in the menu, and then you’ll be able to unleash them during battle! You also have an Awakening Gauge, which fills up when you attack or take damage. Once the bar is full, you can activate your Awakening State and unleash a massive amount of damage with your Skills! There’s even a customization mode, so you can dress your party up! With the ability to equip up to five different accessories and attach them to various body parts, each party member can rock her own style! Even though it’s not actually an MMORPG, there’s an online multiplayer mode so that you can complete special quests with friends. These quests challenge giant boss battles and more, so choose your class wisely for a balanced party! Which class are you most interested in playing? Four (4) PS4 system themes — Decorate your home screen with the Goddesses Advent Theme, Pixel Theme, Chosen CPUs Theme, or Chosen CPU Candidates Theme! Twelve (12) PSN avatars — Nep up your PSN profile with your favorite Goddess! Choose from 12 different avatars of the CPUs or CPU Candidates. This content will be available for all to purchase after October 24. The free Neptune Special Theme and free Catsuit DLC will be available to download from the PSN store on the day of release. I can’t wait to play this! 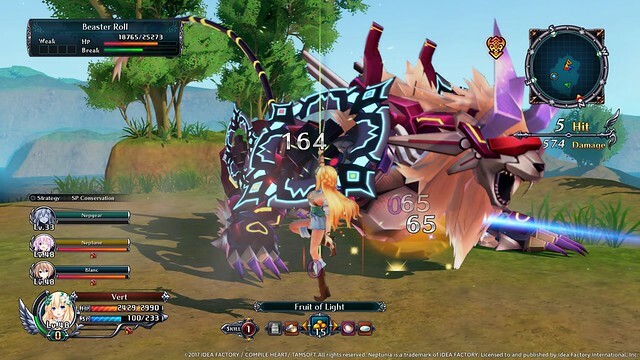 It’s not often to see a Nep game that doesn’t use reused assets and the reviews have been positive across the board. As someone who like getting trophies for fun, this one seems easy and fun. Ha, I wish. The Day 1 stuff was announced after the LE, so unless they include a surprise code or something in the package, nope. Airtight! Hyped for Cyberdimendion. Hopefully the English VAs aren’t too different. Team Black Heart! Noire ftw! Noire is now the same girl who did Elanor in Tales of Berseria. The themes are avatars are exclusive to Digital Day One orders on the PS Storefor two weeks and made availalbe to everyone else after that. This was an exclusive bonus prepared by Sony, rather than IFI. How would you know if it was Sony’s doing? I was excited to (and still am) play 4GO, but I find it kind of disappointing that despite even getting a blog post like this, it’s not up on the PS Store yet for pre-order. I was hoping to be able to play it at midnight, but it seems I’ll have to wait until the store updates tomorrow to play it, which can happen as late as 5:00pm in the evening. Not a major problem, but I had been planning to spend most of the day playing, so it’s a bit of a bummer. @LMC-Mitsukai: It might take until that late for the console store to update, but they normally show up my 2PM Eastern Time if you use the Playstation Store on a computer or through the unreliable mobile app version of the store. I can confirm it’s available now on PSN, and just $50. Looking forward to joining my fellow Neps in Online. 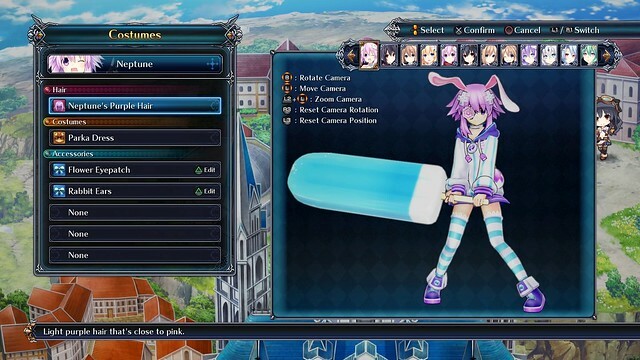 I love the Neptunia games, i have to play this new 4 Goddess online.